This is Judith Jamison. She is the a dancer and choreographer and is currently the artistic director of the Alvin Ailey American Dance Theater. She debuted in "The Four Marys" at the American Ballet Theatre in 1964, and joined the Alvin Ailey American Dance Theater as the principal dancer in 1965. A very tall and strong woman, her career broke boundaries for African American women dancers, especially when she debuted the solo dance Cry, choreographed by Alvin Ailey specifically for her. 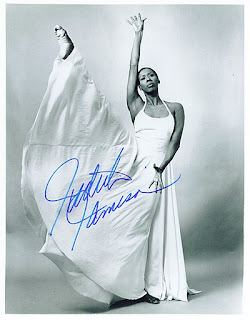 Judith Jamison not only broke boundaries for African Americans in classical and modern dance, she broke boundaries for women who did not meet the petite standard of dancers. Her proteges are also tall and athletic, and her dances reflect a more diverse body type than other choreographers. Judith Jamison. Artist. Trailblazer. Ill-behaved.